Rooibos Tea for centuries indigenous Bushmen in the region, harvested the leaves for use as herbal remedies to treat a variety of different ailments. The medicines were loved for their delicious taste, but as the indigenous tribes dwindled so too did the knowledge of rooibos. Thankfully, in 1772 botanist Carl Humberg rediscovered the leaves, reviving their popularity and spreading interest in the tea further than ever before. Over a century later, in 1904 a Russian immigrant with tea manufacturing connections began to market the drink as a herbal alternative to traditional tea, calling it a “Mountain Tea”. Tea from Asian countries was almost impossible to import during World War II, giving rooibos tea a chance to shine. It became an excellent alternative and was shipped around the world. However, the scarcity of the plant’s seeds meant it was expensive and demand increased its cost further, making it difficult for many to buy. It is only in recent history that the fortunes of rooibos tea have been turned around. Rooibos Tea (pronounced roy-bos) or Redbush is a smooth, caffeine free herbal tea originating from Africa. Whilst it’s popularity in Britain has grown rapidly over the last few years, compared with other teas it is still relatively unknown. Rooibos Tea is grown only in a specific region of South Africa. The plant itself is a broom-like member of the legume family growing in the Fynbos ecoregion. Rooibos or Aspalathus linearis (also A. contaminata, A corymbosus, Borbonia pinifolia or Psoralea linaeris) is a shrub-like leguminous bush native to the Cedarberg Mountains in the Western Cape region of South Africa where it is extensively cultivated within this area for its commercial use as an herbal tea or tisane. After harvesting, the needle-like leaves and stems can be either bruised and fermented prior to drying or dried immediately. The unfermented product remains green in color and is referred to as green rooibos. During fermentation, the color changes from green to red with oxidation of the constituent polyphenols, so the final product is often referred to as red tea or red bush tea. 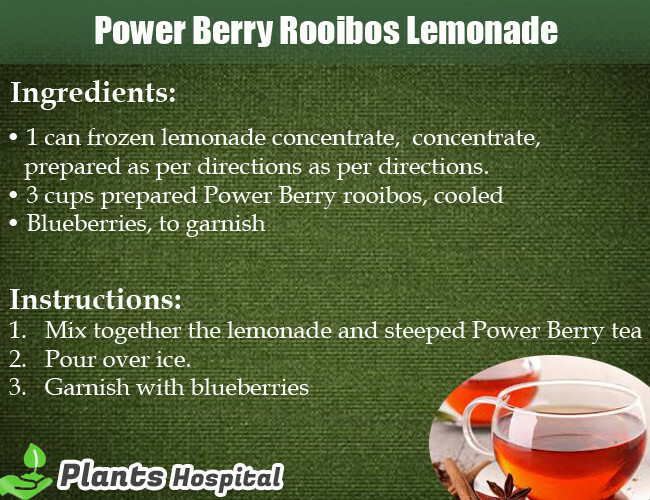 Other names include rooibos tea, rooibosch, rooitea or rooitee. Local inhabitants of the mountainous regions of the Cape Province were the first to collect wild rooibos and use it to make tea. Rooibos became a cultivated crop in the late 1920’s, and it has been grown commercially since World War II. 1 Rooibos is now exported to countries worldwide, including Germany, Japan, the Netherlands, England, Malaysia, South Korea, Poland, China, and the United States. The 300-year-old rooibos (pronounced “roy-boss”) plant is just a baby compared to the 1,000-plus-year-old Camellia sinensis plant that yields what we know as black and green tea. Rooibos Tea is an herb native to South Africa that isn’t even a true “tea” at all. Rather, it’s a plant that when harvested and dried can be brewed into a reddish-brown herbal infusion dubbed “African red tea” or “red bush tea” by the tea industry. Aspalathus Linearis – Rooibos – is endemic only to South Africa. Production areas are mostly in the Cederberg and Sandveld areas (Fynbos Biome) of the Western Cape and the Bokkeveld area (Succulent Karoo) of the Northern Cape. This tiny geographical region provides the perfect environment for Rooibos cultivation. Vital characteristics of this environment are the Mediterranean climate with a winter rainfall between 200 mm and 450 mm per year, deep coarse acidic sandy soils and temperatures that can range from zero degrees Celsius in winter months up to forty-five degrees Celsius in summer. No irrigation is used on the Rooibos plant and this hardy dry land crop is often subjected to drought conditions. The survival mechanism of the Rooibos plant is its tap root that digs down 3m or more into the well-drained, cool and sandy soil. Rooibos is one of 278 species of the Aspalathus genus. The second part of its name – Linearis – refers to the shape of the plant’s needle-like leaves. Rooibos bushes grow to a height of approximately 2m. The Rooibos plant’s narrow leaves have very limited surface areas, which minimizes the loss of moisture on hot days (O’Donoghue et al, 2009: 8). The Rooibos plant has an average lifespan of 6 years and delivers on average 4 crops. It is good agricultural practice to allow a rest period of 2-3 years before re-planting fields. In a full cycle (growing period plus rotation period) the plant’s average lifetime yield is 18000 kg/ha. Like most of the teas, Rooibos tea also has many health benefits. The antioxidants found in it are great for fighting variety of diseases like cancer and it protect healthy cells. It is also known to have the ability to counter the physical negative effects of stress on the body and brain. Polyphenols Polyphenols are organic chemicals with great antioxidant capabilities. The polyphenols in Rooibos have anti-inflammatory, antiviral and anti-mutagenic properties. These phenolic compounds protect the body from free radicals which can cause cancer and heart disease. Several research studies have proved the health benefits of Rooibos in fighting heart disease and premature ageing and in reducing the occurrence of cancer and diabetes. Rooibos tea also assist in weight loss. Now, this is good news for people looking to lose weight. This is one of the healthiest ways of losing weight. Although it may not be wholly responsible for overall weight loss, it does its small part that promotes weight loss. Drink it for a good night sleep: Suffering from insomnia? Drink Rooibos tea for an easy, good night sleep. It is caffeine free drink that calms and relaxes you and helps you sleep by lowering your cortisol level, a hormone that makes you stressed. Rooibos assists in combatting hypertension by reducing blood pressure in general and acts as a bronchodilator in relieving respiratory problems. The tea supports the formation of HDL cholesterol (good cholesterol) and reduces the ability of LDL cholesterol (bad cholesterol) to form a layer on the inside of blood vessels (Joubert, Gelderblom & Louw: 2008). Rooibos tea not just tastes good; it also has many beauty benefits. Rooibos tea is known to fight certain skin conditions, such as Eczema, Sunburn, Rashes, Dry skin and skin Irritation. You can either drink it or apply directly to your face. The antioxidant aspalathin in Rooibos helps to balance blood sugar levels and improves the absorption of glucose. For diabetics, this health property is beneficial in preventing blood sugar spikes and lows. The polyphenol, aspalathin that is uniquely present only in Rooibos, helps to balance blood sugar levels and improve the absorption of glucose by the cells of the body, by breaking down insulin resistance in cells. For diabetics, this health attribute is beneficial in preventing blood sugar highs and lows. Rooibos contains hydroxy acid and zinc which provide relief for skin problems such as acne, sunburn and eczema (Joubert et al: 2008). Alpha-hydroxy acids can also reduce winkles and other symptoms of premature aging. The antioxidants in rooibos slow down the ageing process and seek out free radicals that damage skin by making it vulnerable to disease and degeneration. Rooibos Tea is also rich in manganese and calcium, which stimulate enzymes needed to build and repair bones. Rooibos tea is rich in polyphenols including aspalathin and nothofagin, which are two polyphenol antioxidants. These antioxidants help protect the body by fighting free radicals or unstable cells that attack healthy cells to stabilize themselves. The polyphenols in rooibos tea have anti-inflammatory properties, which assists in preventing heart related illnesses. Finally, the antiviral properties of polyphenols provide an added boost to the immune system, which helps protect the body from common colds, viruses and the flu. Rooibos tea is a bronchodilator. A bronchodilator is a substance that dilates the bronchi and bronchioles and in doing so, it increases airflow to the lungs making breathing easier. With the decrease of resistance in the respiratory airway, drinkers of rooibos tea will get the added boost of preventing common cardiovascular diseases including atheroschelorsis and heart attacks. It may also help combat the symptoms of asthma. Many Americans suffer from poor blood circulation, which may lead to serious health issues including a heart attack. Rooibos tea contains chrysoeriols, which is a flavonoid with antioxidant and anti-inflammatory properties. This compound aids blood circulation and has been linked to reducing cholesterol. It does this by preventing the activity of certain enzymes that are known to trigger cardiovascular diseases. Rooibos tea is rich in several important minerals required for hair growth. This includes zin, calcium, copper and potassium. Regularly consuming rooibos tea may help increase hair growth and strengthen hair fibers, so hair grows healthy and strong. The tea may also help prevent hair loss, as its active ingredients help remove dead skin cells that may block hair follicles and prevent hair from growing. Furthermore, the anti-inflammatory effects of the tea may help relieve the symptoms of dandruff by soothing the scalp. The tea is rich in polyphenols, and these ingredients promote shiny, soft hair and protect against sun damage. Anyone who has ever suffered from asthma, skin issues, eczema, insomnia, bone weakness or hypertension may want to consider drinking rooibos tea. The United States Department of Agriculture has confirmed many of the health benefits of drinking rooibos tea including its ability to reduce the risk of various types of cancer, heart disease and premature aging. It’s also a great tea to drink when suffering from stomach cramps or other digestive problems. Furthermore, the tea is rich in minerals that may help boost the immune system and keep the body healthy. Daily consumption of this tea is also linked to increased anxiety. Moreover, one may also suffer from a temporary increase, if consumed in excess. However, the good thing about aspalathus linearis is that the increased irritability and anxiety due to its consumption decreases naturally after a few hours. But one should remain cautious and not go for an over consumption of this tea. Although it is hard to think that a tea may present side-effects, they key to all things is moderation. At the moment, no research is available that focuses on the long-term effects or side-effects of red bush tea consumption. There are however a few known side effects, like the slow absorption of iron in food. Because of its low levels of tannin, this tea, much like black tea, makes it difficult for the body to absorb iron in vegetables vegetables “not in meat”. Hence, people with iron deficiency are recommended to drink this tea after meals and even consult with their healthcare specialist before including it in their daily diet. Information regarding efficacy and safety in lactation and pregnancy is lacking. The concern regarding pregnancy and taking an herbal supplement is the risk of passing the supplement on to the unborn child. A summery drink that packs a punch with citrus and berry! Rooibos Mousse with Summer Berries. Berries and cream; it can’t get any better until you add the sweet, tangy flavor of Rooibos! 1. Whisk together the egg whites and sugar until light and fluffy. 2. Whip the cream in a separate bowl, sweeten to taste. 3. Dissolve gelatin in the hot Rooibos. Add honey and lemon juice. 4. Gently fold the gelatin mixture into the egg whites, then fold in the whipping cream. 5. Spoon into serving cups and layer with summer berries, if desired. Refrigerate for 1 hour. Enjoy! This is a delicious way to enjoy Cherry Pie Rooibos tea! Baking with it is simple. We’ve added a gluten / dairy free option, too. • 2¾ cups All-Purpose flour. • 1½ cups, plus 2 tablespoon sugar. • 1 tablespoon baking powder. • 12 tablespoon butter, softened. • 4 large egg whites + 1 large egg. • 3/4 cup sour cream. • 2 teaspoon real vanilla extract. • 1 teaspoon almond extract. • 2 tablespoon Cherry Pie Rooibos Tea. • 3 cups confectioners’ sugar. • 1 cup of butter. • 1 to 2 tablespoons whipping cream. • 1/2 teaspoon of Cherry Pie Rooibos Tea. 3. Blend all the dry ingredients into the bowl for the electric mixer including Cherry Pie Rooibos. Add softened butter and mix ingredients together on low speed. 4. Add egg whites, one at a time, then beat mix in whole egg. 5. Lightly stir in sour cream, water, and extracts, beating to keep the mixture fluffy. 6. Grease cupcake pan: 24 cupcake tins (using papers). 7. Bake at 350F. Bake for 18 minutes, then check every few minutes (5 minute intervals at the most) for cupcakes or layer cakes, 30 minutes for 9″x13″. 8. For Gluten and daily allergies there is an alternative option: Gluten Free flour, a great alternative is coconut flour, blend (or one that subs cup for cup) plus 1¼ tsp xantham gum, use dairy free/vegan options for the butter such as vegan butter and vegan sour cream, sub 3 servings egg replacer for the eggs. 11. In a standing mixer fitted with a whisk, blend together sugar, butter and Cherry Pie Rooibos. Keep mixer on a low speed until ingredients are blended and then increase speed to medium and beat for another 3 minutes. 12. Add vanilla and cream and continue to beat on medium speed for 1 minute more, adding more cream if needed for spreading consistency. • 1 Rooibos teabag or 1 teaspoon of Rooibos loose leaf tea (in an infuser, or you can use an infuser mug. 1. Add the teabag or loose tea to your favorite cup. 3. Let your Rooibos tea steep for 5 to 10 minutes. Then, remove the tea bag or infuser. 4. Optional – Add extras (like honey or lemon) to taste, but take a sip first – you may find you love Rooibos just as it is!